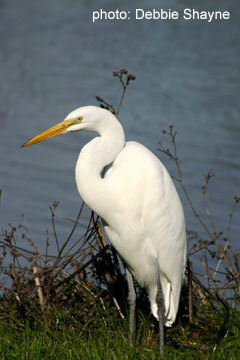 White Crane is a boxing form which has recently re-emerged to world wide interest; and deservedly so. It is a fine boxing form of its own. It is also one of the acknowledged major influences on the formation of Karate in Okinawa. There are numerous subdivisions such as Hungry Crane, Diving Crane. There is also a non-Fukien version variously known as White Crane, LaMa (Lama) and Hop Gar. White Crane is particularly well represented in Taiwan and much of our information comes from that area. As we expand we will add more and more to this important and beloved system. Interested in Fukien White Crane? See our amazing info box . Click on pictures to see larger versions. This volume gives an examination on the nuts and bolts of White Crane from the mechanical and health standpoints. It discusses, in detail, the structure of the system from both the physiological standpoint and with correspondences to the Chinese medical theory. Though in traditional Chinese it comes with a three page introduction in English and the different sections are often peppered with English translation of references such as the names for Qi and other fundamental concepts. Nicely done this over-sized volume has photos and some illustrations of its key points. Other sections refer to descriptions of the various styles and their advantages, five elements theory White Crane style, special breathing arts, White Crane spirit and suggestions for further research. Even more about the saga of what is emerging as one of the most studied of all Kung Fu styles: The White Crane Boxing. This adds much material to the research including an article on the relatively underexposed Ru White Crane. Top level practitioners of this art are few and far between. In the U.S.A. Y.C. Chiang was well known for his boxing demonstrations even into his eighties. Many pieces on the art in this special focused magazine/book: mook. Materials, Demon station, Guide Wang Jin Fa Liu Jin Yi. 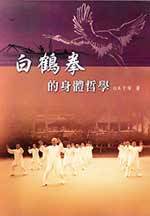 This is a three DVD set of White Crane lectures and demonstrations held in Taiwan. For the dedicated follower of White Crane Boxing or a new enthusiast this is a valuable collection. Each lecturer gives opening remarks then shows some formal exercises and, often, applications on stage. Some speakers brought old video tapes, done in open circle style, of practitioners getting up and showing their stuff. Many of these inserted video tapes looked to be decades old. This Triple DVD is a photographic record of many styles. It is also a kind of document because it records, often in very informal circumstances, the status of a number of older teachers. See below for a list of all the styles and demonstrations covered.Some of these are, basically, footage taken at work places where casually dressed practitioners show what forms they know. We include this in the White Crane section because the Crane is strong in Taiwan (at least for a while longer) and much of the footage records Crane players from a generation soon to disappear. The first disk has many shots of Taiwanese Temples and many of the demonstrations are performed in front of them. Here is a list of the forms. Lineage charts on Wing Chun/White Crane major teachers and student all the way down to Bruce Lee. This set of books, published by our associate, Lion Publishers, brings together historical WHITE CRANE KUNG FU manuals from the Qing dynasty. Not one of these has been issued in a modern edition and this series is a valuable collection for researchers and enthusiasts. The six volumes are almost entirely TEXT and have very few pictures. Commentary by two modern masters is added. Note: This is not a cheap set. But it is beautiful. The covers of these books are embossed (raised) and gorgeously colored and designed. The whole set comes boxed (which due to shipping MAY be dinged a little). The Chinese font is elegant and there are facsimiles of the original editions included in many cases. For someone doing scholarly, translational work or just for the enthusiast we recommend these. At about $10.00 US per volume there's little reason to hesitate. We get shipments about periodically from Lion, so if we don't have the series please be patient. 1. Yong chun Zheng Li-Shu's Teaching Text: no author, evidence indicates that this was written in the Qing dynasty. This manual has two parts: the first called Fist Methods taught at Bai Lian Temple. The second part shows treatments for internal and external injuries. This is not a simple translation and there is a good deal of vernacular in the Chinese. The numerous anatomical charts are quite quaint. 2. "Authentic Teaching Handed Down from The White Crane Immortal Teacher": Written in the Qing dynasty, Emperor Qian Long (1736-95) period. The author, was called Lin Dong. And he was a fifth generation inheritor. Of the entire set this manual contains the most information on the guiding principles of the four forms of Crane Boxing; i.e. Feeding Crane, Flying Crane, Perching Crane, Whooping Crane. Much of this material may be lucky to survive as some was destroyed in a fire and this comes from a hand copied edition. This material - with illustrations of figures - is probably the most "hands on " of the volumes with descriptions of evasive methods, strikes and other fundamental elements of the art. 4. Major Points: Zheng Qiao, a 5th generation inheritor, is the author here. This text was written around 1795. Its literary style is more common and its attitude more practical. It summarizes Zheng Qiao's experiences teaching the White Crane Boxing system. 5. Taoyuan Boxing: Taoyuan is not a real place. It is a Utopian land of harmony that fits in a number of legends, particularly Taoist ones. The town of Yong Chun (not related to Wing Chun Style) was also known as "Taoyuan" a very long time ago. 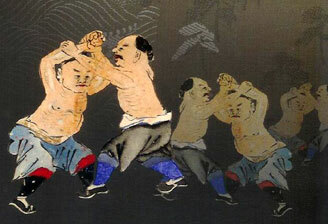 The Yong Chun area is very important in the history of White Crane Boxing. It has a section on opponents which discusses practical fighting situations. Xiao Bao Shi, its author, was a 5th generation disciple. The manual comes from the Qing dynasty, circa 1796. 6. 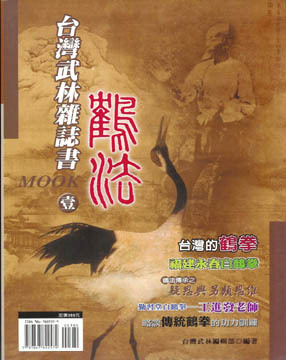 "White Crane Boxing's Founder Fang Qi-Niang": Written sometime in late Qing dynasty this manual is not attributed to any author. This book discusses teaching methodology. It suggests that the "Three Battles" form be the first practice set. The Three Battles form acknowledged as the model for San Chin Kata; a very important element of many karate styles.